Our wall coverings have been provided for designers, interior displays, reception areas and high impact experiences. The range includes our most popular satin laminated self adhesive wall covering for quick application and wipe clean advantages, as well as a large range of printable wallpapers in a variety of textures and finishes. IT'S NOT JUST A WALL, IT'S AN OPPORTUNITY. Due to the self adhesive capabilities, the installation is faster than traditional wall paper which makes for a lower cost installation. The prints are satin laminated which allows for wipe clean advantages, especially effective in high traffic areas. Our digital printed wallpaper range includes three quality grades to suit any project; Muramour paper backed, Digimura 1.1 fabric backed and Digimura 2.1 fabric backed. 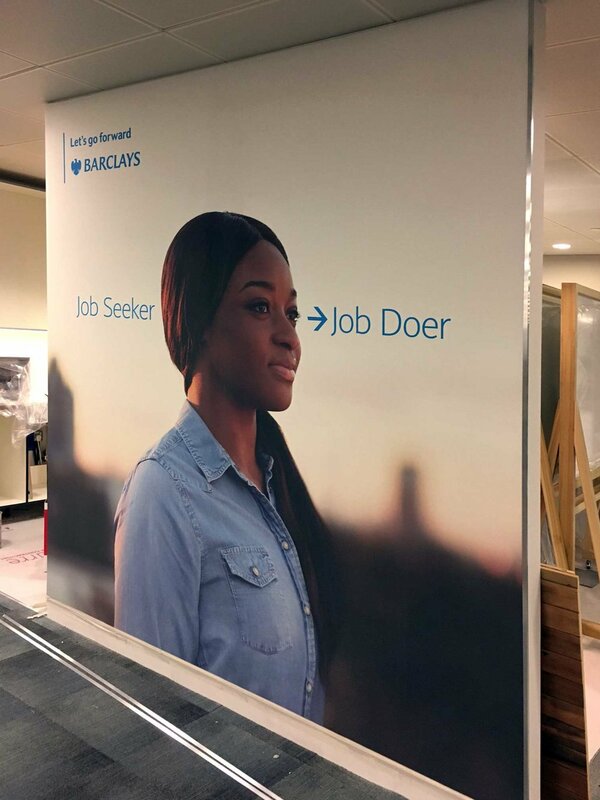 These printable wallpapers are used widely across the UK and Europe, and the quality and print-ability is why we have chosen to use this range at Edge Signs. All these wallpapers are 'Class 0' fire rated. Walls are fantastic spaces to promote messages and visual branding awareness. We have enhanced many walls in restaurants, bars and commercial buildings with vinyl part wall coverings. Be inspired and creative! - Edge Signs can turn wall spaces into areas to promote your business to your customers or even to inspire your staff! Doors can also be an amazing space to stamp some identity, or simply to just make a functional threshold more interesting for you, you're staff and clients. We use our satin laminated film for all our door prints as they can easily be cleaned without damaging the print, and are very durable. WE ALL NEED TO BE INSPIRED FROM TIME TO TIME. Take a look at wall coverings from around the world, take some inspiration and get your own project under way.